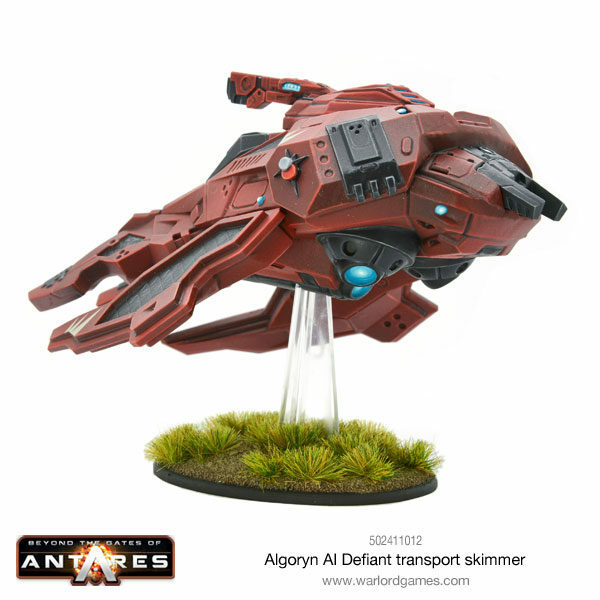 Transport your troops into the midst of a battle with the new Algoryn AI Defiant transport skimmer. The Algoryn are a proud and warlike people whose society has evolved over many centuries of constant warfare. All Algoryn are fighters in some fashion, dedicated to the furtherance of their unending conflict against an implacable neighbour: the strangely inscrutable Ghar. Algoryn forces are some of the most experienced and effective in the whole of Antarean space. This detailed resin and metal kit has been crafted by our warlord 3D designer Marco to a superb standard before heading into the manufacturing process, looked after by our Warlord Artizans. The final result can be seen here, painted by Warlords own in-house painter Andreas Amian. 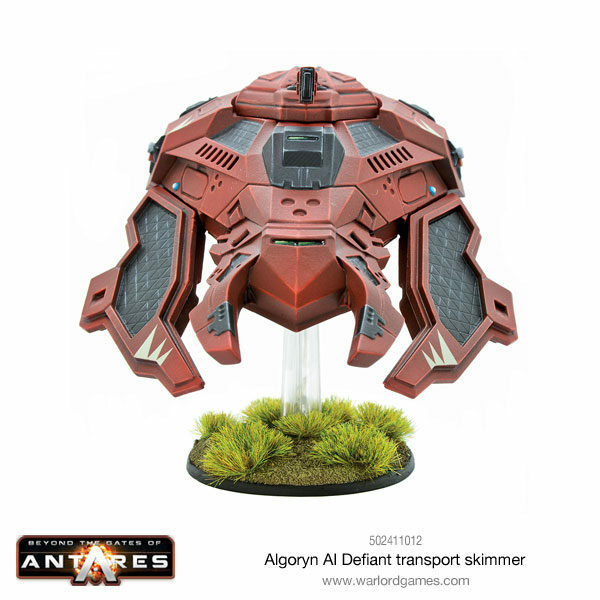 The Defiant is a universal transporter that serves as a troop transporter and cargo carrier. 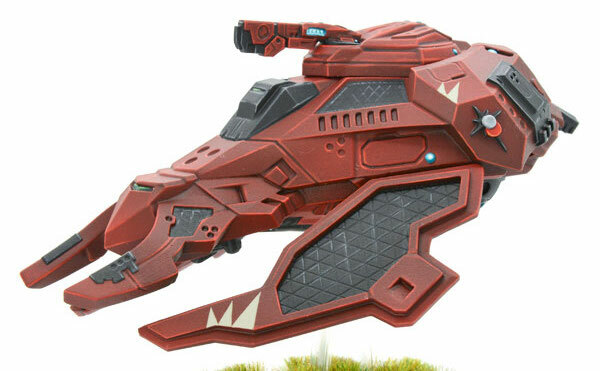 It is the ultimate workhorse of the Algoryn forces, capable of shifting men or equipment rapidly over long distances. Sharing its core design feature with the Liberator Combat Skimmer, it retains gravity-defying suspensors, composite skin and hyperlight envelope. This armoured envelope can be boosted to intermediate or full combat specification depending upon the role undertaken. Defiants are not just transporters, but fully-functional fighting vehicles designed to mount the reliable mag light support. All Algoryn Skimmers carry crews enabling machines to function semi-manually as well as fully independently, a characteristic quality of Algoryn fighting doctrine which emphasises human control and decision making over that of machine intelligence. 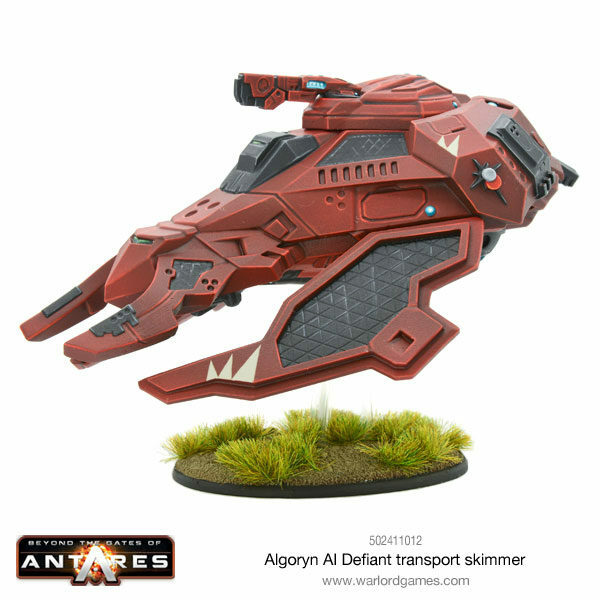 Take the Algoryn AI Skimmer into Battle Today.